Gone are the days when you could identify a Buick, Chevy, or Toyota at a glance. So many cars an trucks look a lot alike these days, that you can hardly tell one SUV or sedan from another. So, it’s up to the owner to provide that personal touch and make their car or truck uniquely theirs. Here are some ideas for all kinds of drivers, from those who like to stick to be basics by keeping things simple to the ones who like to stand out from the crowd and rev up their ride with more elaborate touches. Here’s an essential for new drivers who are thrilled to finally have their own car, but haven’t yet thought ahead to their first roadside emergency. A vehicle emergency kit may not be flashy or exciting, but flash and excitement don’t mean a thing when you’re stranded with a dead battery or other malfunction. 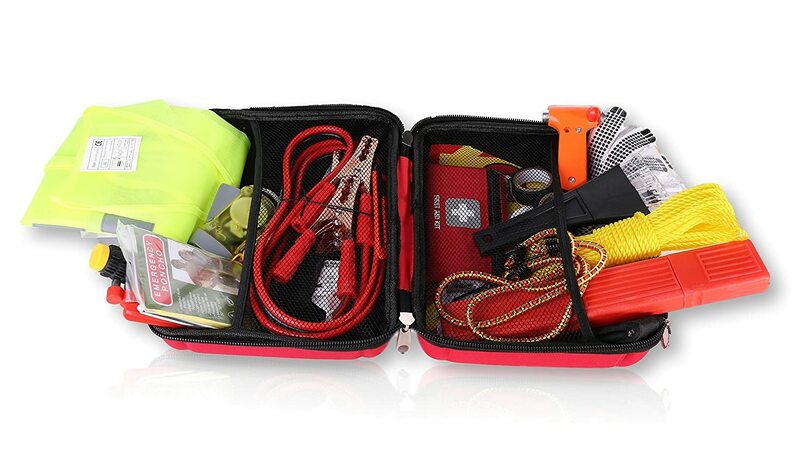 The 104 components in this kit will help with just about any emergency, including minor injuries. Included are tools, a safety vest and poncho, jumper cables, flashlight, emergency sign, and more. There’s even a 62 piece first aid kit that includes a first aid reference guide. This is also the type of thing that would be appreciated by the person who likes to be prepared. 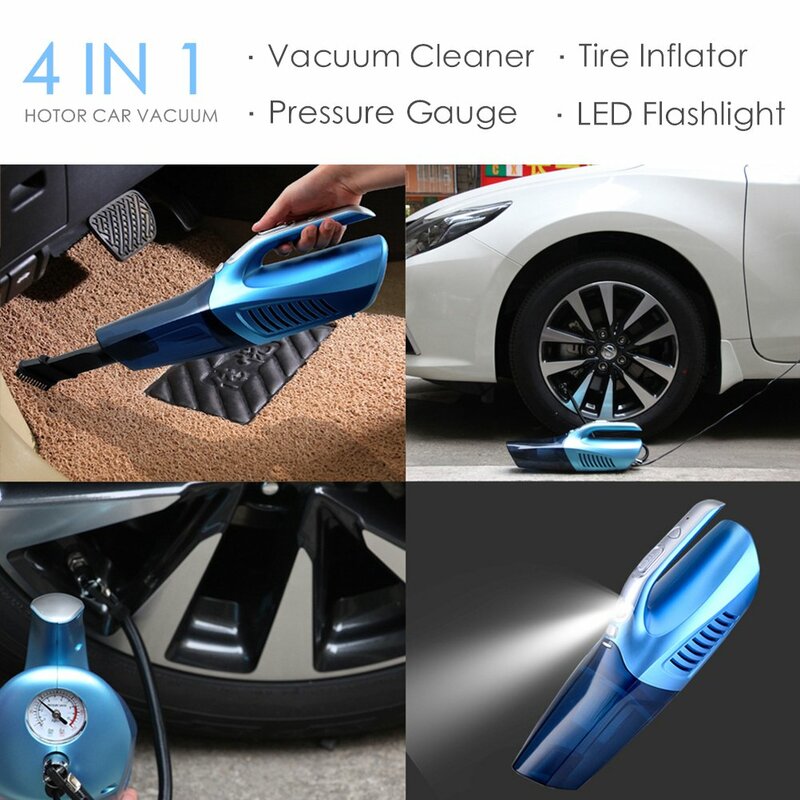 Amazing four in one vehicle accessory combines a hand held vacuum cleaner with hose and attachment, a tire pressure gauge, an LED Flashlight, and a tire inflator.The light, vacuum, and inflator are powered by plugging into the vehicle’s cigarette lighter, so they can be used virtually anywhere, even during a roadside emergency. Comes packed in a handled carrying case. Bonus! The inflator can also be used to inflate other items, like swim toys and air mattresses, making it perfect for the beach or camping trips. Sometimes, it’s the little things that make a difference, and this monogrammed car air freshener may very well be one of those. Custom printed with your initial superimposed onto the view of the sea through a ship’s porthole. This cool personalized accessory is printed on both sides, and infused with your choice of five odor eliminating scents: Cucumber & Fresh Mint, New Car, Emerald Sea, Fast Lane, or Island Breeze. It’s easy to customize. Just specify the initial you want in the space provided, and choose your scent. Voila! Stale or musty odors get eliminated, and the vehicle interior gets a personalized touch. Details count! Here’s a blingy item in the ‘little things can make a difference’ category, and it’s one that will appeal to the ladies. 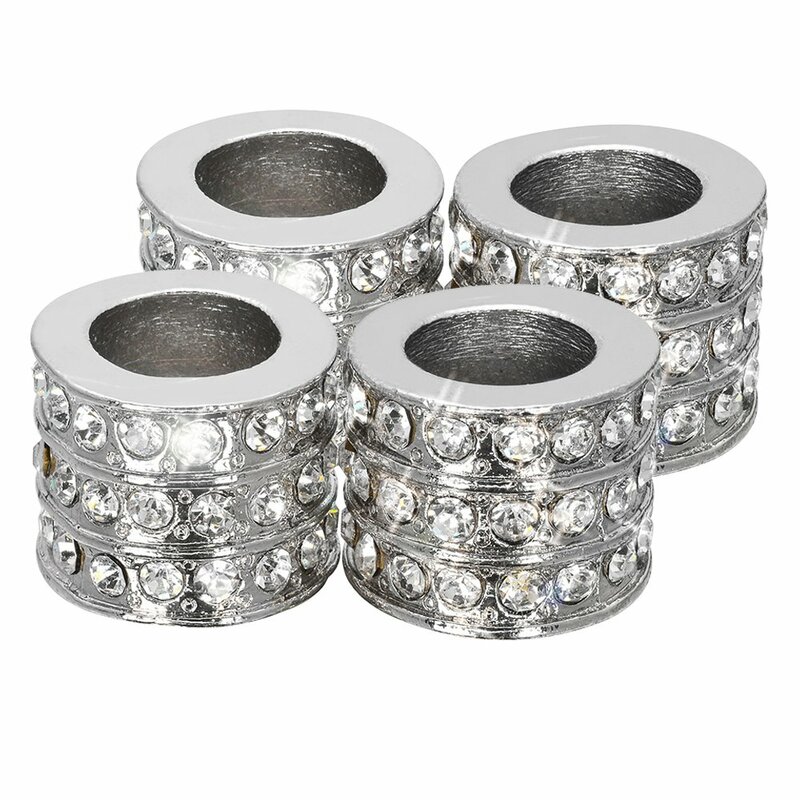 It’s a set of four crystal studded chrome collars to cover the support poles of the seat back headrests. Rev up that ride with a little sparkle in an unexpected location. Best of all, there’s no complicated installation involved. These chrome rings just slip around the existing standards that hold up the headerests. A drawback is that there is no quick delivery on this item, so plan ahead and allow up to three weeks for shipping. From a little pizzaz to a lot! 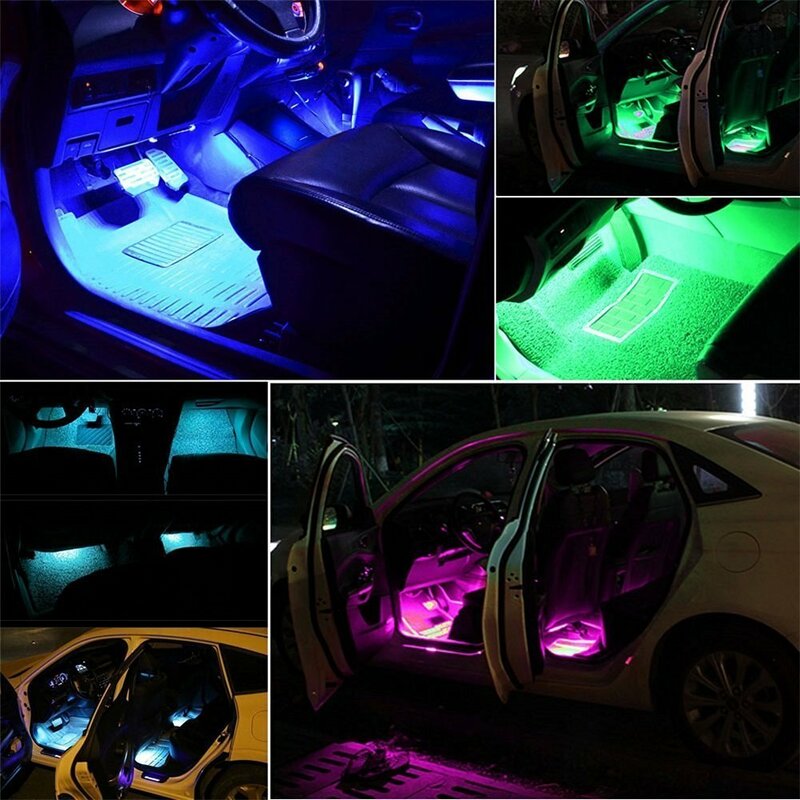 Light up the lower interior of your ride with LED lights that change colors to the music you play. Rest easy – they can also be set to glow a single, steady color, and made to glow bright or more dimly. Choose your mode to suit your mood or impress your passengers. No, you don’t have to have an electronics degree to install them. The light strips are adhesive backed, so they just stick on, and the adaptor plugs into the cigarette lighter. Be sure to follow the included instructions to be sure the music response feature will operate when activated. Lighted on off button on adaptor and remote control are both included. In any of the 19 U.S. states that require a license tag on only the rear of the vehicles registered there, that blank space near the front bumper can be used for a custom plate. In those states, that space in front provides an opportunity for motorists to express themselves with a bit of color, their names, or some other favorite design. The one shown here is one of the more popular designs at print on demand site Zazzle, combining both color and a custom message. The color comes from a crimson sunset over a bay on the coast of the Gulf of Mexico. The text is whatever the buyer wants to make it, within the constraints of the space available. Personalize it by having a name or names printed there, show support for a local sports team, or even choose a few inspirational words. The 6″ by 12″ plates come your choice of plastic or aluminum. Protect your dash and seats from the harsh heat of the summer sun whenever you must park in an unprotected area. Sure, you can use one of those plain windshield sunscreens, but why would you, when you can protect your interior with a bit of island beauty? However, if you’re not in the mood the tropical, this one is reversible to plain reflective silver on the other side. It folds up accordion style, and fastens with a strap, so you can stow it conveniently in the trunk or cargo space when not in use. 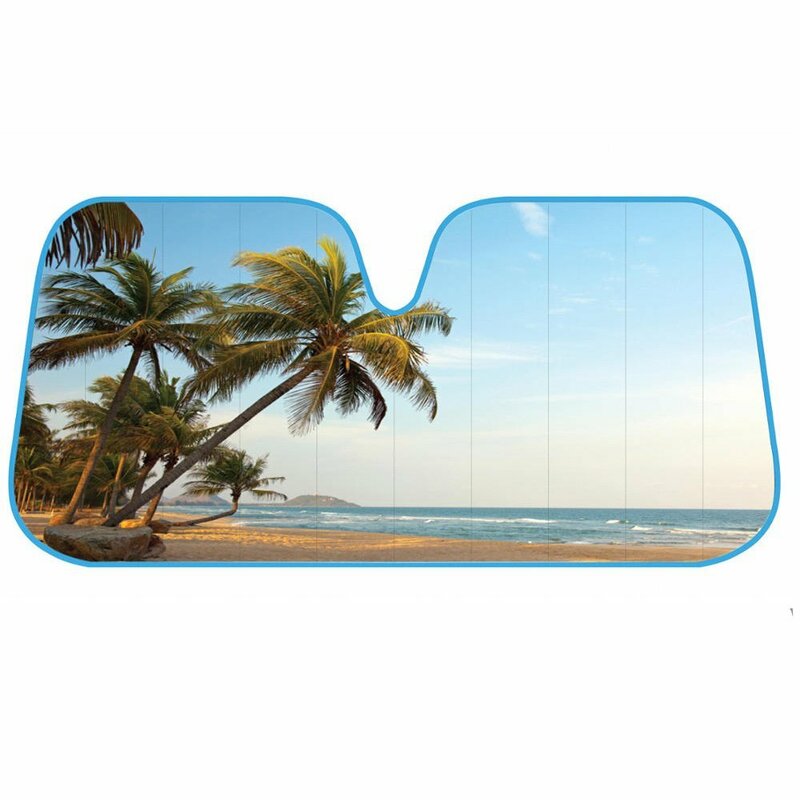 Keep vehicle interior cooler and safe from harsh UV rays with your choice of this or two other tropical summer scenes. Steering wheels can show their age over time, from exposure to the sun, as well as normal wear from constant use and exposure to normal skin oils. The simplest solution to that problem is a steering wheel cover. 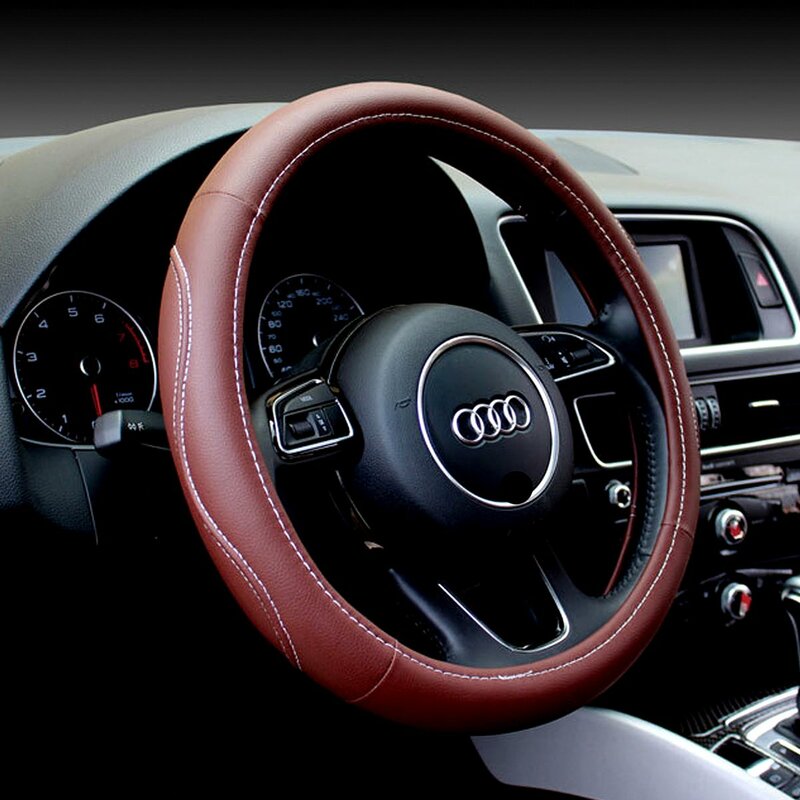 Make it an attractive one, with this beautiful leather wheel cover that comes in several colors. Select from black, brown (shown) or gray, to coordinate with your interior. These classic leather covers are heat, cold, and wear resistant, and are sized to fit most steering wheels – those with a 14.5 to 15″ diameter. Make the inside of your car or truck welcoming, comfort your feet, and protect the flooring at the same time with custom car floor mats. Caressed by an afternoon breeze, tropical palms on a tropical island sway against a blue and white marbled sky on this set of car floor mats. Mate to fit most standard interiors, they come in sets of either two or four mats. Choose a full set, or a pair for the front only or just the back, to fit your needs. These durable mats have a wipe clean polyester front, with non skid backing so they’ll stay in place while resisting stains from spills and dirt. 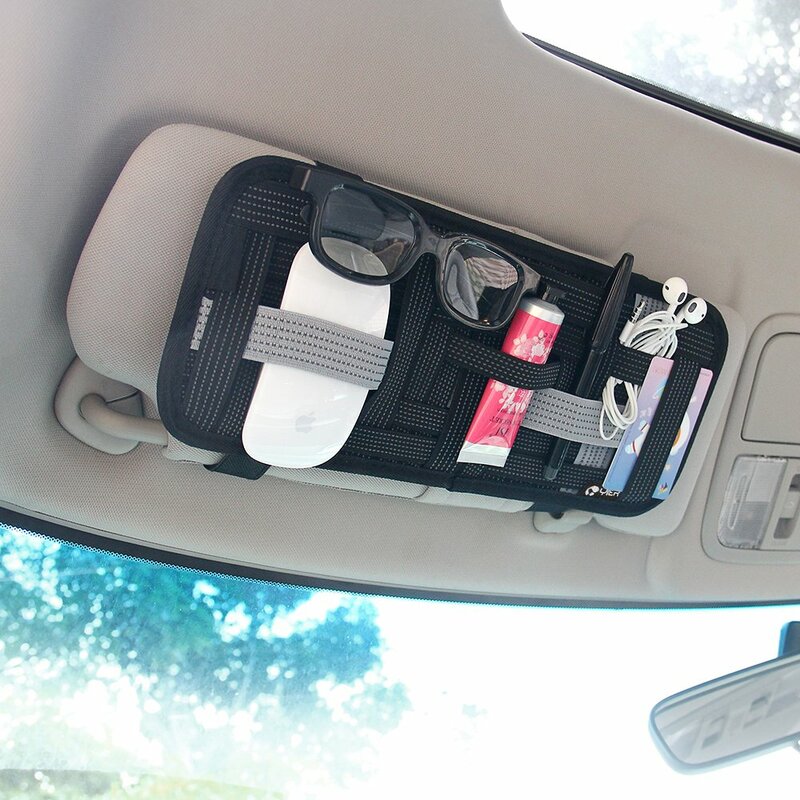 Car sunvisor organizers are ubiquitous, and come in a variety of configurations. Some hold papers, a pen, and sun glasses, others are made to hold CDs or DVDs. But, here’s one that’s different. It’s made to securely hold anything you want it to. This clever organizer consists of a ‘grid’ of elastic bands. Choose a band, secure an item. It’s that easy. No more figuring out which items can fit into presized pickets, and which simply won’t quite fit there at all. Fastens to your visor with velcro straps. This visor organizer holds pens, notepads, small electronic components, sunglasses, cards, whatever you want at any given time. Easy! Two inch monogrammed trailer hitch cover fits over most pickup truck, RV, and SUV receivers. With a bit of a sea theme is perfect for covering the bumper hitch for your boat when the trailer is not in use. It easily fastens onto your receiver with your existing hitch clip. Your specified monogram initial floats over the image of moonlight playing on gentle sea swells. Made in the USA.